Plastic surgical techniques were described in antiquity and the Middle Ages; however, the genesis of modern plastic surgery is in the early 20th century. The exigencies of trench warfare, combined with medical and technological advances at that time, enabled pioneers such as Sir Harold Gillies to establish what is now recognized as plastic and reconstructive surgery. The physicians of Germany, Russia, and the Ottoman Empire were faced with the same challenges; it is fascinating to consider parallel developments in these countries. A literature review was performed relating to the work of Esser, Lanz, Joseph, Morestin, and Filatov. Their original textbooks were reviewed. 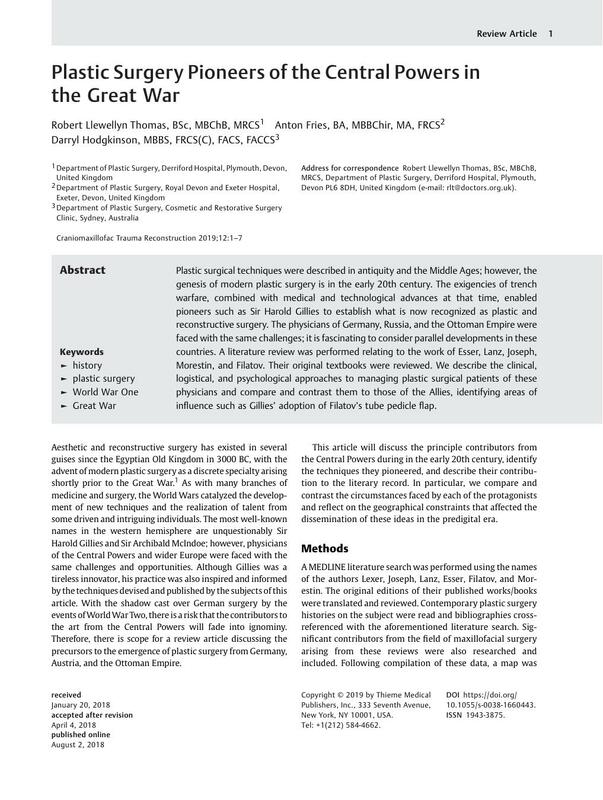 We describe the clinical, logistical, and psychological approaches to managing plastic surgical patients of these physicians and compare and contrast them to those of the Allies, identifying areas of influence such as Gillies' adoption of Filatov's tube pedicle flap.